WHAT’S DONE, IS DONE tells the story of Trish, an outsider who is fed up of watching all her schoolmates having fun from her bedroom window. Trish decided to do something about it but events take a gruesome turn for the worst and Trish is forced on a harrowing journey through the hell of her own making. Bold, original and innovative, WHAT’S DONE, IS DONE is a thought-provoking piece of theatre that asks “How far would you go to get the respect of your peers?” Inspired by Shakespeare’s famous tragedy MACBETH, the play takes the themes of power, guilt and the supernatural and puts a contemporary spin on them. The battlefields of Scotland become the battlefields of the playground, as Trish and her schoolmates fight for power, popularity and acceptance. 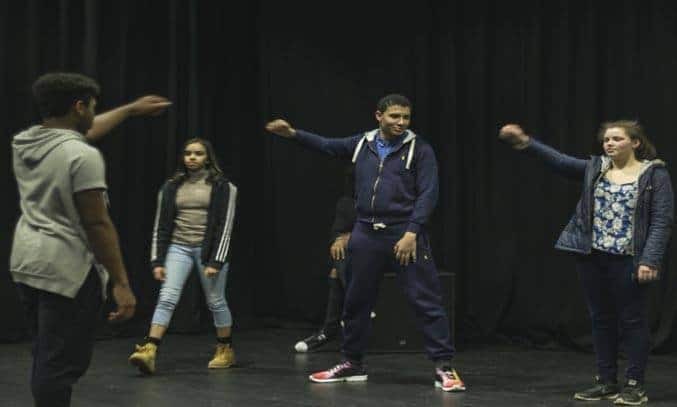 The 45 minute play is performed by CAN Young Artists aged between 12-18 years from diverse communities in Manchester. Dance, live music, movement and drama are used to tell the eerie story, which also features a demon drummer, a host of nightmare creatures and a mystic in fluffy slippers. The young cast handle the dialogue well, with the short scenes keeping the pace fast and the story interesting. The simple but effective set makes good use of the space and the innovative use of lighting makes the ghost scenes seem all the more eerie. Disappointingly, an otherwise excellent performance was interrupted sound issues in which the dialogue was difficult to hear over the loud drumming. That said, the young artists handled their first performance well, with the artists playing Trish, her loudmouth little brother and her rival Rachel particularly standing out. WHAT’S DONE, IS DONE made its debut performance at HOME on 19 March 2016.